This time we look at Leo Kottke’s treatment of the Duane Allman classic Little Martha. The piece is easy to moderate, but the altered tuning may be unfamiliar to some. This arrangement of Little Martha appeared on Leo’s 1986 album A Shout Toward Noon. A significant reference point in the development of contemporary acoustic fingerstyle playing, Leo has been recording since 1969 and I have lost count of the number of releases he has made, but it is at least 30! Be sure to check out his debut album 6 and 12 String Guitar (sometimes known as The Ant and the Armadillo because of the cover art work) or more the more recent release, Peculiaroso. The tuning for this arrangement is the altered tuning DADF#AD. The tuning is more commonly known as Open D, as the open strings sound like a D major chord. Open tunings are very popular among blues and slide players as they enable easy access to the primary chords of the key (the “Three Chord Trick”). Leo actually tuned his guitar a further half-step down to open D flat. Rather than challenging you or I to read or write in the more “involved” key of D flat, I have left our transcription and recording in open D. Once you have learnt the tune, simply drop the pitch of each string down a semitone. Then, when you meet Leo, you can play the tune with him! The chord shapes are very simple, with significant use being made of the open strings. The opening harmonics section should be fingered as suggested in the notation (use your ring finger to play the 12th fret harmonics and your index finger to play the 7th fret harmonics). This will minimize the left-hand movement, and enable you to be more accurate when playing up to speed. In bar 9, and subsequent bars, there are many instances where a bass note is played twice in quick succession. Play these double bass notes with your thumb and index (in that order!). Bars 13-14 are a note-for-note transposition of the 9- 10. You just play a barre at the fifth fret and play the same phrase. The Coda section is a departure from the previous rhythmic phrasing. There is a series of slurred double-stops at the end of bar 30 leading into a cool legato ran. 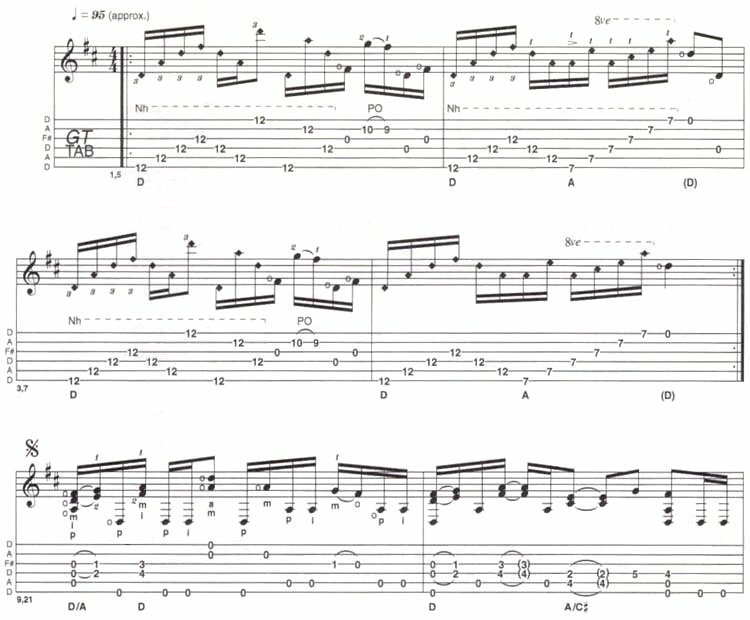 It’s just a part of Leo Kottke Little Martha guitar tab and sheet. © 2012 - 2019 TabsClub Powered by TabsClub 41 queries in 0.268 seconds.